On a hand-drawn map, Ulpotha is a thumb span beneath Anuradhapura, capital of Sri Lanka’s early kingdom, where the Sacred Bo Tree still grows 21 centuries after the sapling was planted there by a princess. In Sinhalese, Ulpotha means water spring. They say it has been called that for thousands of years. Most things in Sri Lanka work in millennia rather than centuries. Five years ago an investment banker from Colombo named Viren Perera bought eight and a half acres of land and a ruined manor house from a teacher. He was enchanted by a book the teacher had put together about the estate, a careful study that reminded him of projects he had sweated over at school with his Caran d Ache pencils and glue. He had a vague idea about rebuilding the house and the traditional village of Ulpotha one day, creating a place to practise Puranagama, the old system of self-sustaining village life, a place where the people could grow all the food they needed and pursue a lifestyle uncontaminated by external influences from the modern world. Beyond the tank (a man-made lake which now waters the resculpted village) a narrow path falls down from grass meadows where water buffaloes graze. The first view of the Walauwwa, the main house of Ulpotha, is from the bottom of steep steps cut into the path. To the right of the house is a separate wooden-pillared pavilion, the Ambalama, an open room where people loll on piles of cushions, talking in voices softer and slower than usual. Above and beyond them is a roofscape of rippled pitch-tiling, European in style. It is one of the legacies of the Portuguese and Dutch colonizers whose influence stretched across the 16th, 17th and 18th centuries. Just a droplet in terms of Sri Lanka great lake of history. Beyond the Ambalama is a pillared verandah with hot yellow walls. Through jack wood window frames there is an internal courtyard washed in the blue of the Brahmin houses of Jodhpur in north India. 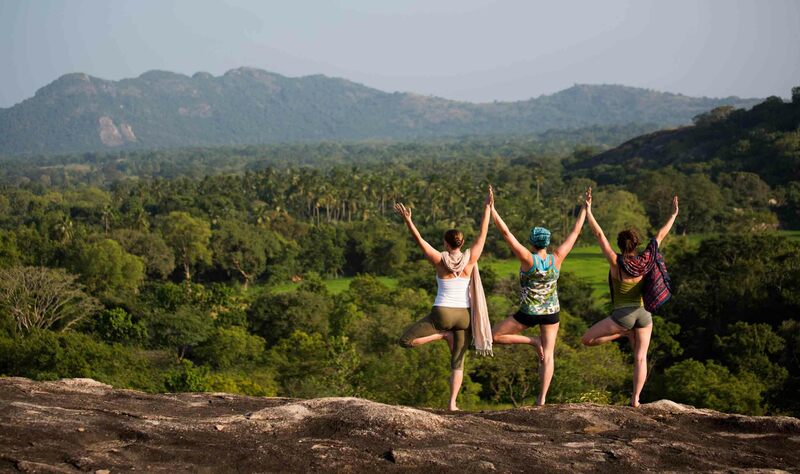 The cultures of Sri Lanka are symbiotic, gliding one into the other. They have always been this way. Parts of the outside of the manor house are painted the ferrous red of the Palace of the Winds in Jaipur, the pigment that can be picked up along any road around the Pink City, crated over from Rajasthan. Colours jump from one room to the next, the yellow verandah into the blue courtyard, the red bathroom into the yellow hall through to the green bedroom. The yellow paint did not have so far to travel. Traditional methods using flowers from flame trees to make the pigment were tried. It was romantic in notion but in practice faded too fast to a pale nicotine. Yet beyond the bright paraphernalia of the verandas, halls, bedrooms and curvaceous bathrooms, the exterior is a reserved white. It is really the story of Ulpotha, one of its re-creators mused. Yes, it is traditional in essence, hence the formality of the white outside and then all the colour bursts out within. I suppose it is an allegory of the state of affairs here, the traditional exterior, a sort of wildness beyond that. The story of Ulpotha is one without formal design. Viren bought the land and the ruins of the manor from the teacher with the charming book. He then set in motion his vision of bringing the dying land back to life. Tennekoon, a shamanic character who had convinced Viren about the greater good of traditional methods, began to rebuild from vague sketches made on scraps of paper during long evenings that led into longer nights. On just such a night Giles Scott, tired of his life in London, decided that he too could see the potential in Viren drawings. He joined Tennekoon and Viren on the project. It was a perfect adjunct to his new career as one determined to turn leisure into a profession. The rebuilding of the house and mud huts of the village did not follow any master plan or indeed any kind of architectural design at all. Viren enlisted the help of an assistant of Geoffrey Bawa, Sri Lank leading architect and builder of Colombo parliament. The fluid structure of the project came from Tennekoon vision and, most importantly, the voices of the village people, those who were going to live in Ulpotha all year round, farm the land, look after the village, the house, the guests and the project’s future. Many details have been almost accidental in their inception. Viren smiles at one of his stories of design by default. I noticed that one of the flat stones in the guest bathroom had cracked. It began to nag at me whenever I saw it until I just propped it against the wall. Someone put the soap on it. Then the stonemason carved a place for the soap. A design consultant was staying in the hut and waxed lyrical about the pure design of the soap stand, where a shaft of sunlight hit the stone and lit up the soap. Nothing planned. I love that. In my own wanderings around the vegetable and flower gardens, the water meadows and jungle of Ulpotha, butterflies pulsed from trees and bushes in small, brilliant clouds almost as if by design. Nothing planned. I love that.